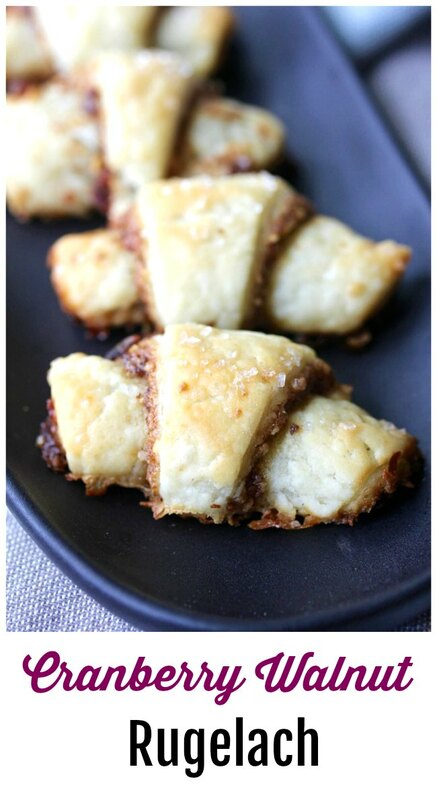 Originally, rugelach were made with a yeasted dough that did not contain dairy. Now, the cookies are typically made with a butter and cream cheese dough, although I'm intrigued by the yeasted version, and may just have to attempt making it very soon. The dough for these cookies consists of just butter, cream cheese, and sour cream barely held together with a bit of flour and a tiny bit of salt. Because the dough is only about thirty percent flour, it's important to chill it before filling it and shaping it. This dough does not contain any sugar. The cookies get all of their sweetness from the filling. In fact, these cookies are only mildly sweet, kind of like a filled croissant. Just know that it can be frustrating to work with this dough if it gets too warm while you are trying to roll up the cookies. I had to work very quickly to roll up the cookies before the dough stuck to my work surface. In fact, I had to use a dough scraper occasionally just to nudge some sticky parts off of the counter. It was all worth it! These were very tasty, not too sweet, and perfect with coffee or tea. I also have another recipe for delicious blueberry pecan rugelach on this site that I posted four years ago. That recipe has a bit of sugar in the dough, along with some baking soda. Both recipes are fabulous, however, I found this version with no sugar and sour cream produces an amazingly even more tender and flaky dough. Both the dough and the shaped, unbaked cookies can be frozen up to four weeks before baking. After baking these cookies, you can freeze them for up to 30 days. In the bowl of a food processor, add the flour and salt and pulse to combine. Add the butter, cream cheese, and sour cream and pulse until the dough forms chunks. Divide the dough into three equal pieces and press each into a round disk with smooth edges. Wrap each in plastic wrap and refrigerate for an hour. If you refrigerate them longer, and they are too hard to roll out, let them sit for about 30 to 45 minutes at room temperature to soften the dough so it won't crack. While the dough chills, make the filling. In the food processor, pulse the sugar, walnuts, cranberries, and cinnamon until finely chopped but not gummy. Take one piece of the dough and roll it out on a floured surface to a 10 inch circle. Brush it lightly with water or apple juice. Spread 1/3 of the filling over the rolled out dough, all of the way to the edges and gently pat it to help it stick to the dough. Cut the dough like a pizza into 12 equal triangles. Beginning with the wide end, roll up the triangles. Place them, point side down, on a parchment lined baking sheet. Repeat with the rest of the dough and filling. Brush the cookies with milk or cream and sprinkle with granulated or sparking sugar. Heat the oven to 350 degrees F. Place the shaped cookies in the refrigerator while the oven is heating. Bake the cookies, one sheet at a time, for 25 to 30 minutes, until golden. Let the cookies cool on the pan. 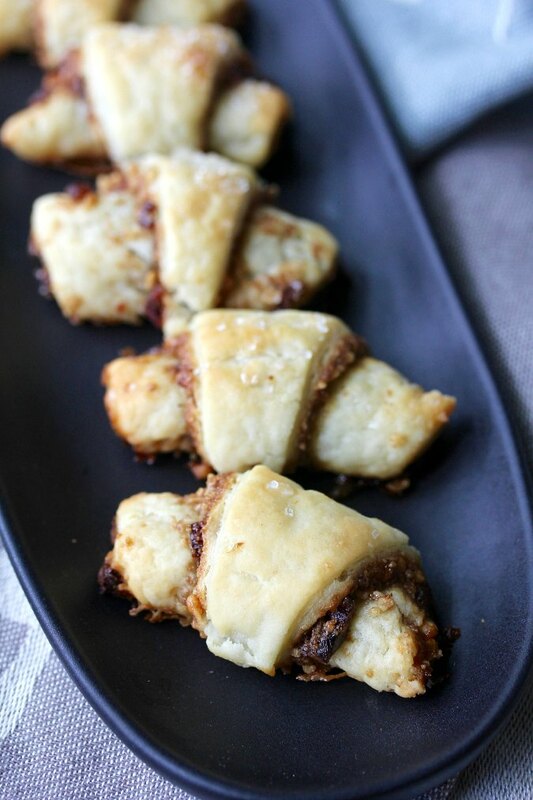 Never made rugelach, and worse than that... never had one! 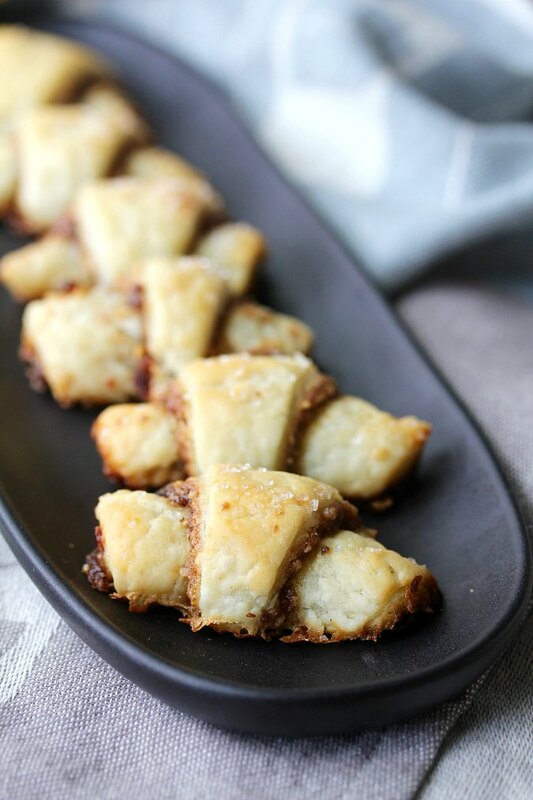 What a fun pastry to bake... go to my files! he he he... I am a sick person, it's true! I was thinking about making them for Christmas cookies week. These look so delicious that I just might have to make these instead. Can't wait to see if you do! I like that these are less sweet because it suits me. I'd probably drizzle these with icing for those with the really bad sweet tooth to keep everybody happy.